Simon is from Belfast and has always loved reading books and magazines. 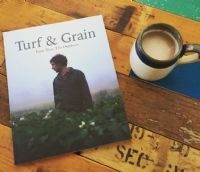 He started Turf and Grain, as he wanted to tell the stories of the people around him, and to show just how many amazing people live all around us in Ireland. At Turf and Grain, they believe that everyone has a story to tell, thoughts and experiences to share, that can help us bring meaning to our own everyday lives, our own struggles and worries, joys and sorrows.